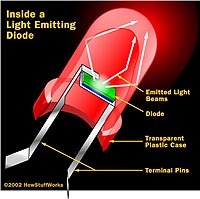 A light emiting diode is basically a PN junction that emits light when forward biassed. The schematic Symbol of a light emitting diode shown in figure below. When a diode is forward biased ,free electrons recombine with holes near the junction. Since the free electrons fall from a high energy level to low energy level ,they radiate energy.ln case of a rectifier diode the radiated energy is in the form of heat while in lED´s the energy radiates as light. LED´s have replaced incandescent lamps in many applications because the LED´s have a low operating voltage, Iong life and fast on-off switching speed. LED emit visible radiation when the PN junction is diffused in GaAsP, infrared if it is constructed from GaAs. The diodes are available in several colors. The most common colors are red and green, but there are even blue ones. most generally The leds available 3 colors. Red Green and Blue. Some of The device combines a in one package. The led polarity can be found with a Multimeter or using a 1,5 V battery.